Just in the nick of time here is my November recipe for my Twelve Cookies of Christmas series! It combines two of my favorite flavors, cranberries and key lime. 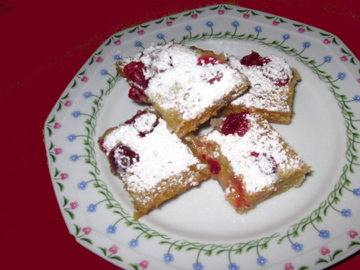 If you’re not a fan of tart foods, you may skip the cranberries and just make key-lime bars. 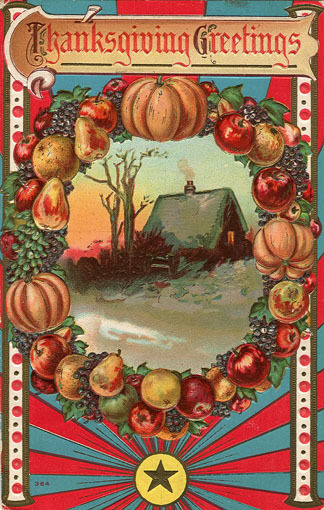 The cranberries lend lovely holiday color and flavor, however. Preheat the oven to 325 degrees. Butter an 8-inch-square pan. First, prepare the butter crust. 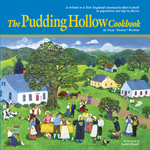 In a small bowl combine the flour, confectioner’s sugar, and salt. Cut in the butter. Press this mixture (it will be crumbly!) into the bottom of the prepared pan. Bake for 25 minutes. Remove the pan from the oven and allow it to cool for 5 minutes. Press the cranberries into the crust (they may or may not press down effectively; if they float up, they will be just fine!). Move on to the key-lime filling. In a bowl whisk together the eggs, sugar, salt, and key-lime juice until they are thoroughly combined. Whisk in the milk, followed by the flour. Pour the filling over the crust and cranberries, and return the pan to the oven. Bake until the filling sets and the edges are just a little brown. In my oven this took about 45 minutes. Allow the bars to cool in their pan; then cut them into squares. My quest to use cranberries goes on. Lately, my mother will only eat warm sandwiches. So we have been making lots of panini. We don’t have a panini press, but my brother’s George Foreman grill works just fine. In a pinch I have even used two cast iron pans, one under the sandwich and one pressing down on top. It took my cranberry-obsessed brain only seconds to come up with the concept of CRANini. Variations on these themes are up to you. My nephew Michael wasn’t crazy about the idea of cranberry-chipotle mayonnaise so he made a turkey sandwich with turkey, cranberry sauce, and Swiss cheese. He didn’t bother with any mayonnaise at all, using the cheese and the cranberry sauce to bind his sandwich. Anyway, here are my two variations. 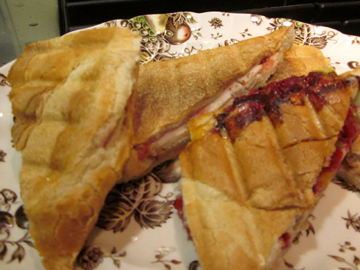 The turkeyberry sandwich takes a little forethought since the cranberry-chipotle mayo tastes best made in advance. If you’re interested, click on the image above. 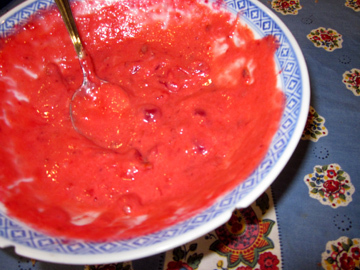 Cranberry-Chipotle Mayonnaise is VERY pink! 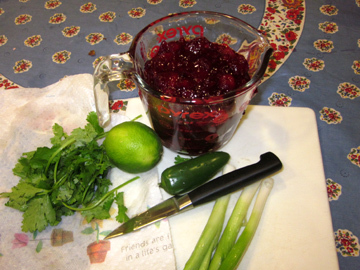 First, prepare the cranberry-chipotle mayonnaise. In a bowl stir together the mayonnaise, cranberry sauce, chipotle pieces, and salt. Cover and refrigerate for at least 1 hour. Put a small amount of the prepared mayonnaise on each side of the bread. On one side of the bread, cover the mayo with turkey and then the cheese. Put a small amount of mayonnaise on one side of the bread, and spread tuna salad on top. Cover with a little cranberry sauce (too much will spread all over your pan while cooking), the cheese, and the other piece of bread. Press the sandwich together while cooking. Serves 1 happily. Apparently, growers have gotten so good at cultivating cranberries that they produce more and more of the things every year. 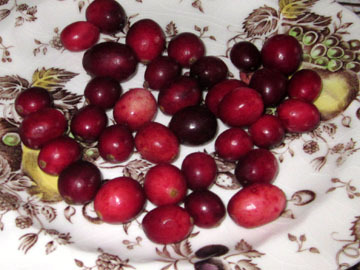 If they can’t sell these tiny red pearls, the growers are told by the U.S.D.A. to let them rot in their bogs. I was taught by mother that wasting food is a crime so naturally I have to help any crimson beauties doomed to end their lives in the bog like some pathetic monster in a horror movie. I hope readers will do their part as well. 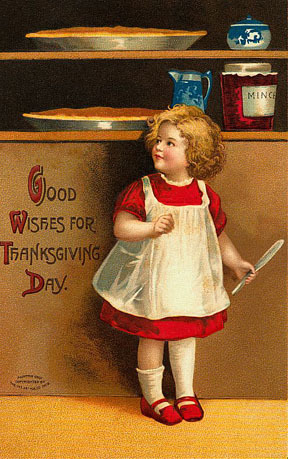 Make cranberry sauce to accompany your turkey for Thanksgiving tomorrow, of course. Also please consider serving it with hamburgers, garden burgers, ham, fish, and eggs. Its flavor is as perky as its color. See how many baked goods you can create with cranberries or dried cranberries this holiday season—muffins, cookies, scones, pies, cakes, breads. Finally, think about cranberry-based main dishes and appetizers. I am working on a cranberry pot roast for Christmas Eve. If it tastes as good as I think it will, I’ll share that recipe here. 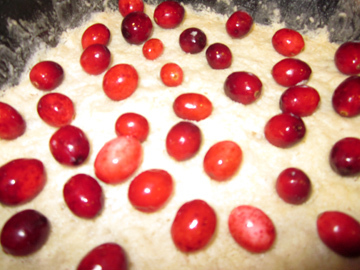 In the meantime, here is a simple cranberry recipe suited to Thanksgiving or any other day in the next month or so. Regular readers may have noticed that I have a positive passion for upside-down cakes—pineapple, rhubarb, peach. The other day I got to wondering how cranberries would work upside down. Of course, they were fabulous. 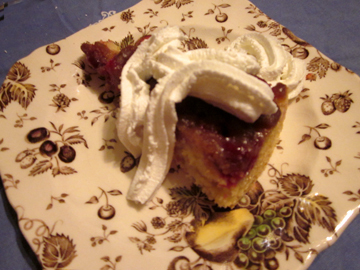 The berries provided a tart contrast to the brown-sugar topping. 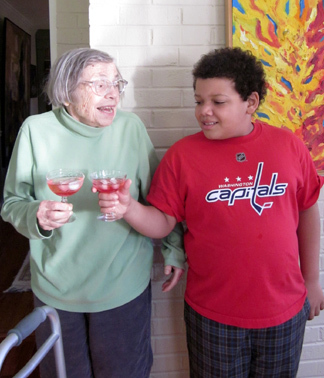 My mother Jan and nephew Michael toast the holiday with a nonalcoholic cranberry cocktail. First make the topping (which goes on the bottom). Melt the butter in a skillet—a 9- or 10-inch cast-iron skillet, if possible. Stir in the brown sugar and cook, stirring, until it melts and bubbles—3 to 4 minutes. If your brown sugar is old, it may have trouble melting properly, in which case you’ll need to add a little more melted butter to it. Try to avoid this if you can; the cake is rich enough without it! I was recently stuck with old sugar, however, and had to punt. If you’re using the cast-iron skillet you may continue with the recipe at this stage and cook the cake in the skillet. 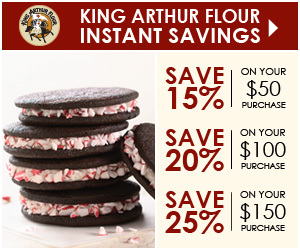 If not, transfer the brown-sugar mixture into a 9- or 10-inch round cake pan. Spread it through the bottom of the pan. Arrange the cranberries on top as artistically as you can. In a separate bowl cream together the butter and sugar. Beat in the eggs, 1 at a time, beating well after each addition. Beat in the baking powder and salt. Add the flour and milk alternately, beginning and ending with the flour. Stir in the vanilla. 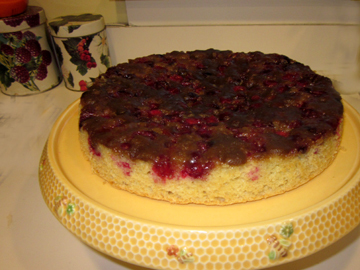 Spoon the batter over the cranberries in the cake pan or skillet, and place the pan in the oven. Bake until the cake tests done (in about 40 minutes). Let the cake stand for 10 minutes; then invert it onto a serving plate. You may need help with this if you use the cast-iron skillet as it feels a bit heavy during the inverting process. This cake is best served slightly warm with or without a little whipped cream. This recipe comes from Loyce Cofer of Tyler, Texas, a loyal reader of this blog. Loyce is 70 and lives in East Texas with Don, her husband of 51 years. I asked her about her life, and she replied that the pair had sometimes had to struggle to make ends meet. “We’ve managed with a lot of perseverance,” she added. 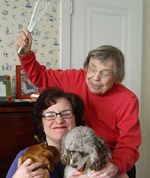 Loyce can’t cook or get out as much as she used to since she suffers from diabetes and neuropathy in her feet. 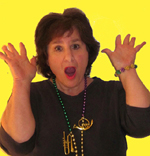 She is also a seven-year survivor of breast cancer. Despite her aliments she is grateful for every drop of rain in her dry area and for the gifts of life, friends, faith, and family. “My life as a stay-at-home mom was rewarding in a way as I loved our sons so much and strived to make it warm and welcoming,” she wrote. 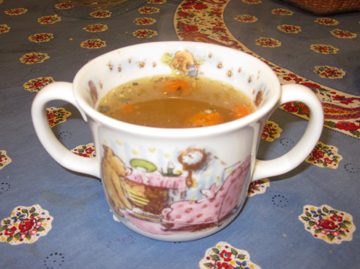 Obviously, this chicken soup—perfect for the cooler weather and the season of colds and flu –would contribute to the literal and figurative warmth of that home. The recipe may be increased or decreased as needed. Here’s a tiny photo of Loyce with her husband Don taken during the spring flower display in Tyler, a town famous for its azalea trails. Place all the ingredients in a stock pot and slowly bring them to a boil over medium heat with the pan covered. Watch the pot so it won’t boil over. When the water comes to a boil reduce the heat and cook the soup, ALMOST covered, for 3 hours, adding water if needed. Loyce skims the fat from the soup as she cooks. I’m not very good at this so I waited until it was done (see below). Remove the ingredients from the pan and strain the stock away from the sold ingredients. Save the pieces of chicken (without skin), carrots, and (if you like) the onion and celery bits; mine had given their all so I discarded them. If you haven’t skimmed the fat off, refrigerate the stock and other ingredients until the fat solidifies at the top of the stock pan. 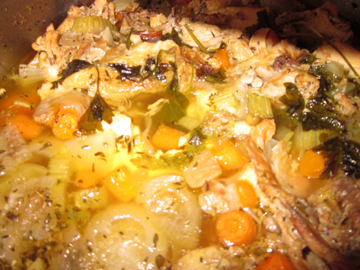 Remove the fat, add the saved bits of chicken and vegetable, and bring the soup to a boil again. Let it cool slightly before pouring it into bowls. Serves 4 to 6, depending on the size of your chicken pieces and the amount of water you added. Loyce likes to serve this with cornbread. I’m a last-minute girl in a last-minute family, I’m afraid. So we’re only now starting—and I do mean starting—to talk about the menu for next Thursday. As we contemplate contemplating Thanksgiving my family members are enjoying a combination of two of our favorite foods, cranberries and salsa. The salsa below is quite mild. At one time, I thought all salsas had to be ultra hot. Lately, however, my palate is craving subtlety. You may of course add more jalapeño—even more lime and cilantro if you wish. We’re enjoying this version right now on chips and on crackers with cream cheese. We may even throw it on the Thanksgiving table next to the turkey and see what happens. This is a simple vote; you don’t have to register or anything weird like that. I’ll let you know if I win. Thank you—and now here’s the salsa recipe. In a medium bowl combine the scallions, pepper, cilantro, and lime juice. 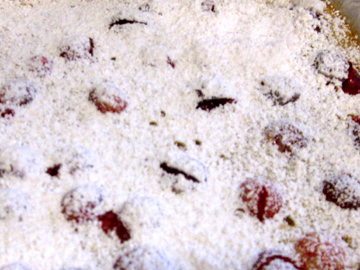 Stir in the salt, then the cranberries. Mix thoroughly. Chill, covered, for at least 1 hour before serving. 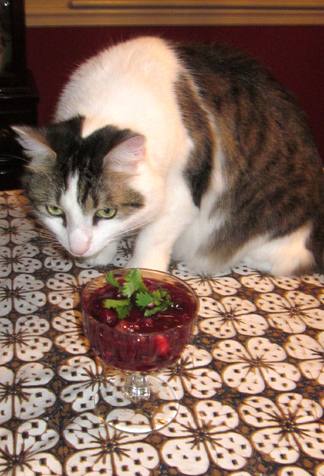 Miss Mogli is not sure what to make of cranberry salsa. The human members of the Weisblat family love it.